The idea was as cute as the chapeaux that Antonio Long, Randy Johnson, and Marlen Kirby (from left to right in photo above) invariably sport at AudioVision SF. Schedule a public demo on November 14 with two French manufacturers, Triangle Loudspeakers and Devialet, and call it "French Fries." 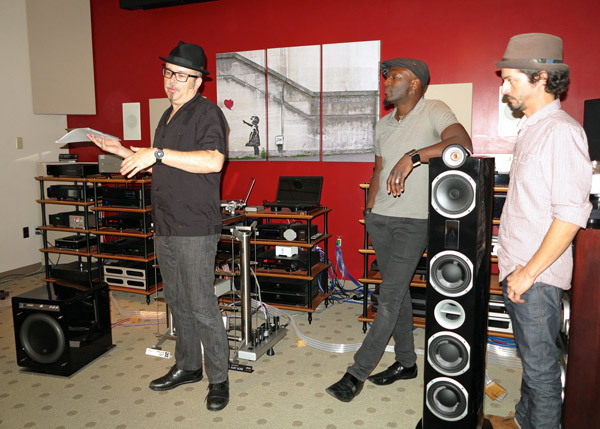 Then, however, reality intervened, and an evening that included debuts of two products, Triangle's Signature line Alpha loudspeakers and Nordost's Sort Füt Premium Kit, morphed into a Franco-American feast complete with Norwegian-American trimmings. For starters, the distinctly American Long gave Triangle's spiel after scheduling conflicts nixed an appearance by a company rep. Next red, white, and blue Matt Riley of Audio Plus Services presented for Devialet. 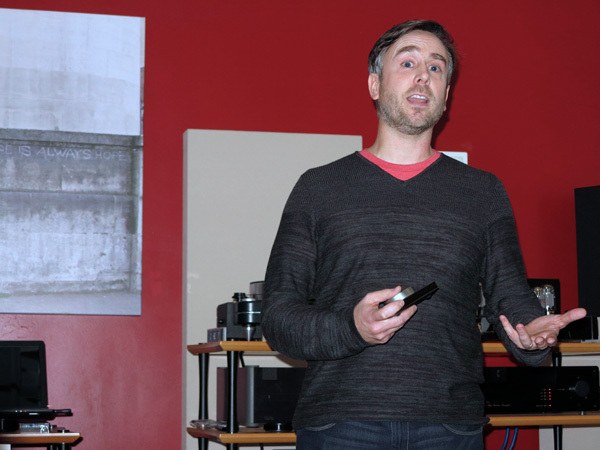 Then, two reps from American companies, Jim Knight from JL Audio of Florida and Michael Marko from Nordost of Massachusetts, also gave presentations. 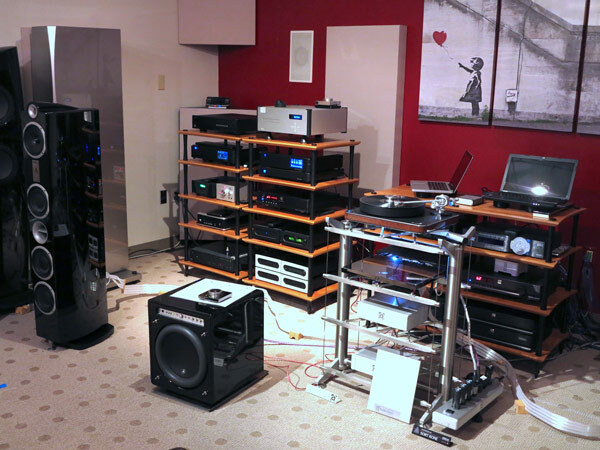 Finally, Marko, Knight and Long all emphasized that, while there's nothing wrong with the Chinese-manufactured products that AudioVision sells, nothing beats Nordost and JL Audio's 100% made-in-America quality control. Put that all together, and what we actually ended up with was a cross between mashed potatoes and home fries au gratin, the latter cooked above a fjord. Long, who noted that the company's Theta loudspeakers ($4200/pair) were on active display in the other listening room, called the new Alpha "detailed, ridiculously fast, and highly efficient. We've gone over it with a fine tooth comb, and the build quality is very impressive." 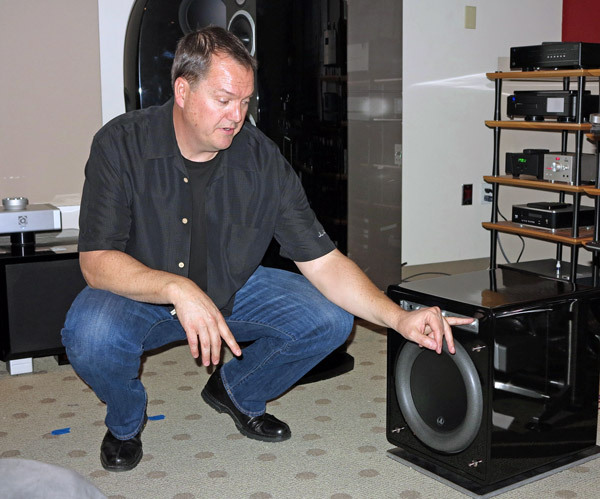 Given that the Alpha easily descends to 32Hz on its own, Long and Knight crossed over JL Audio's F1112 subwoofer ($3200) at 30Hz. There was even a second French connection to the pairing, since the Devialet D170 integrated amp/DAC/streamer ($9500) performed the crossover honors via its internal crossover. Throughout the evening, verbal presentations were reinforced by musical selections. Perhaps it was because everyone operating the system was standing way above tweeter height and right against the right wall that most of the music was pitched at volume levels that overdrove the room. That the sound was invitingly warm and colorful, with extremely impressive bass, could not obscure midrange resonances and other distortions on the voice of Ana Karam and a recording of a movement from Dvorak's New World Symphony. "Devialet's all-in-one, completely configurable French design takes the place of all your big boxes," Matt Riley (above) told the full house. "Devialet can even work with you online to program the unit's SD card with your exact cartridge load." The D170 is fully operational via its classy, substantial remote control or an iPhone, and allows wireless streaming up to 24/192. Amplification is AHD, a combination of class-A for voltage and class-D for current, running in parallel. (See John Atkinson's January 2013 review of the flagship D-Premier for full details on this topology.) "It has the shortest signal path of any amplifier made, and is very fast, with lots of driving power," he claimed. The unit's software is also firmware driven, and is upgradeable via an SD card. When sourcing a multi-tracked recording of French vocals from his Macbook Pro, Riley deserved an award for choosing the most reasonable volume levels of the evening. As a result, his chosen tracks, which also included a fine acappella male quartet whose deep bass was having a ball playing with his delicious voice, did the best job of conveying the excellent, extremely fast and detailed sound that the chain of Devialet, Triangle, JL Audio and Nordost can produce. 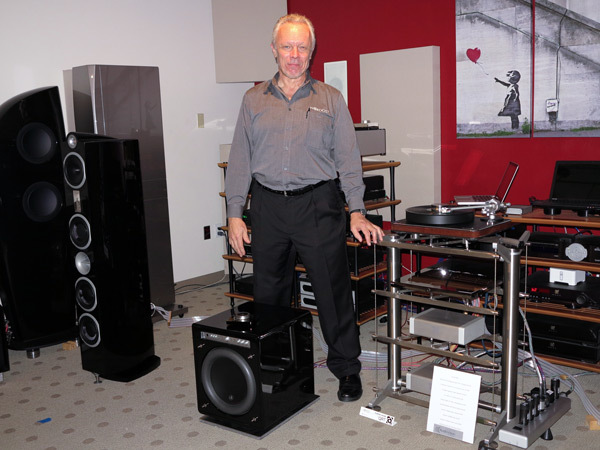 Jim Knight (above) declared JL Audio "absolutely an audiophile company from the ground up. Everything is developed without concern for price point; our co-founder, CEO, and chief engineer, Lucio Proni, is not concerned about the money." JL Audio's new E110 sub ($1500) and F112 were six years in the making. The F112 boasts a seamless fiberglass enclosure, its driver alone has 7 patents, and it also offers automatic room optimization circuitry. "A pair is absolutely the way to go," Knight said of a system that, due to space considerations, only appeared to have one F112 in operation. The next track, from France's Daft Punk, was played while turning the F112 off, on, off, and on. Although the sound level was too high, the recording convincingly demonstrated that as deep as Triangle's Signature Alpha loudspeakers may descend, the addition of JL Audio's F112 subwoofer can impressively fill in the bottom end and support the music without in any way obscuring or distorting information above 30Hz.